Marksmen are a four piece from Tampa. 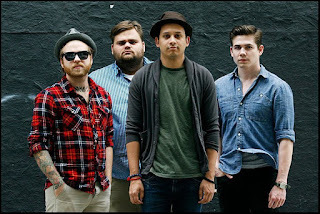 The band includes Matt Segallos - guitar and vocals, Chris Brickman - guitar, Glenn Espinoza - bass, and Reed Murray - drummer. Recently, Marksmen brought their blend of indie-alt-rock sound out on the road with Eisley. Here, Reed discusses a bit further about the band known as Marksmen. 1. What made you decide to start a band? It was never my intention to start a band. I had always wanted to be a part of a project that I believed in and enjoyed playing drums for, but at the same time, the idea of being in a band left me feeling skeptical - it's rare to find other musicians who you completely connect with as people and also have the same musical vision as yourself. Geographer are a 3 piece based out of San Francisco. The band consists of Nathan Blaz on cello/electronics, Brian Ostreicher on drums/vocals, and Mike Deni on vocals/guitar,keys. Recently having wrapped up a tour with Ladytron, Geographer brought their blend of indie-synth-pop sound. 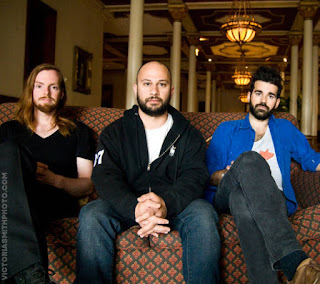 Here, Mike gives a bit of insight into the band called Geographer. 1. Who or what are some influences for the band? Radiohead, Bruce Springsteen, Paul Simon, Arthur Russell, Prince, Kate Bush, and Terry Riley are heroes of ours. 2. How do you think being San Francisco based benefits or maybe hinders being in a band?